I pray God leads you in bossing your heart to beat in sync with His for 2014 and every moment of every day of every year to come! Wow, wow, wow, I’m blown away by the support God has lavished upon us after yesterday’s announcement!!! Thank you for praying, sharing, and supporting our family in this seemingly impossible endeavor! On Christmas Day, God confirmed our family is to pursue the adoption of a precious 13-year-old girl from China who has Down syndrome who is desperately in need of a forever family. China will not allow children to be adopted after they turn 14, and this little girl's birthday is in early March. This means we must RACE to get her adopted before she ages out in March (meaning she will not be adoptable and will never know the love of a family). Just as God has promised to not leave us as orphans, we will not leave this sweet girl as an orphan either. With God, all things are possible!!! China is a Hague treaty country which requires a Hague accredited adoption agency. The agency has estimated the cost of this adoption to be approximately $30,000. Every life is precious in His sight, and no amount of money is greater than the value of life. We are grateful for your shirt purchases because your shirt is helping give LIFE to a little girl with little hope for a future if she's not adopted by early March, 2014. In case you aren't familiar with our family, you may read more about us on our blog at www.AllArePreciousInHisSight.com. We have 11 children: 3 are biological, 8 are adopted (1 of our daughters lives with Jesus now). Our children are from Texas, Colombia, Serbia, Haiti, and Ukraine. We're excited to learn more about China and its culture as we pursue adopting the teenager our hearts have fallen in love with. 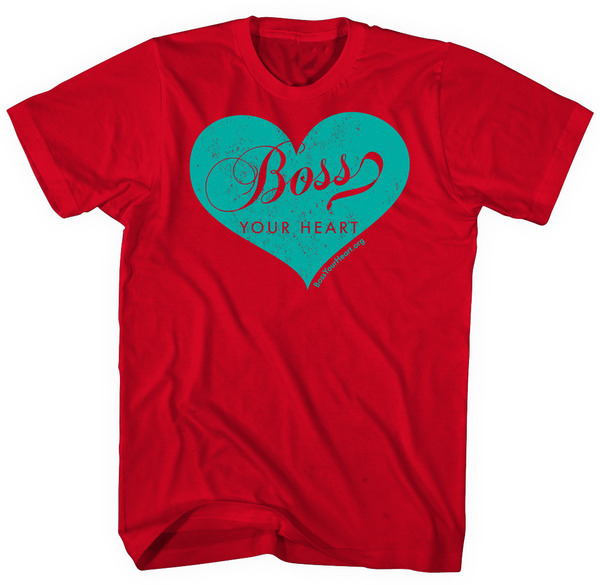 We pray the large heart on this shirt will remind you that love multiplies, it doesn't divide. Regarding the shirt design, it is our hope to replace the popular slogan, "Follow Your Heart", with the truth of what we should do--"BOSS Your Heart"! Our daughter, Chrissie, went to live with Jesus in May 2010, and the legacy she left behind is BOSS your heart! (You can read more about her legacy at www.BossYourHeart.org .) According to scripture, our hearts are deceptive and will lead us astray, so the last thing we need to do is follow our heart. We need to boss our hearts to beat in sync with His! We chose a red shirt because of the ancient Chinese proverb, "An invisible red thread connects those destined to meet, regardless of time, place, or circumstances..."
The shirts will be delivered approximately 2 weeks after the fund closes. If you're looking for the perfect shirt to wear for Valentine's Day, this is it!!! We're excited to see people around the USA proudly wearing their shirts and reminding people to BOSS their hearts, NOT follow it!